BannerSaver Outdoor Street Light Pole Banner Brackets and Banners. 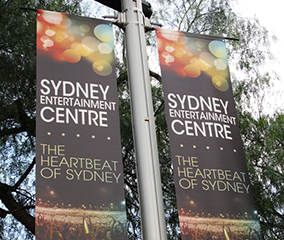 Custom printed light pole vinyl banners and flags offer a highly visible, effective and safe means of promotion. 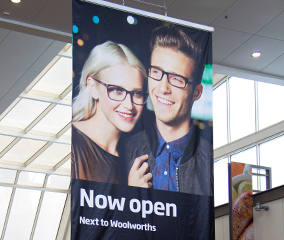 Councils, shopping centre managers and property developers use advertising banners with BannerSaver™ light pole banner brackets to safely brand, beautify and promote business areas and the facilities available. 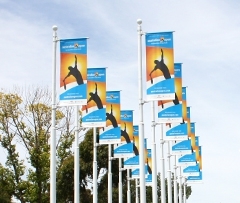 Bay Media’s unique spring loaded BannerSaver™ banner brackets for lamp posts and light poles ensure your light pole advertising banners & flags remain taut and looking great at all times with no need for unsightly wind holes or troublesome breakaway clips. The BannerSaver™ light pole banner brackets are the only street light pole banner brackets that significantly reduce wind loading on columns and protects outdoor banners and flags from twisting and tearing. 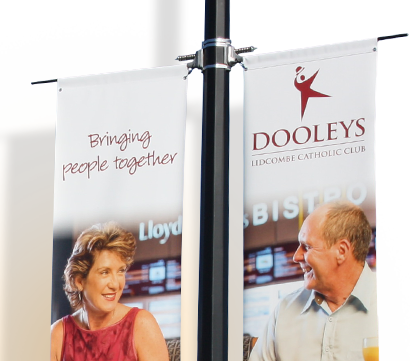 The exclusive BannerSaver™ design ensures your advertising and promotional banners have a far longer life than fixed arm banners or flags, whilst providing high quality hassle free promotion, branding and advertising. 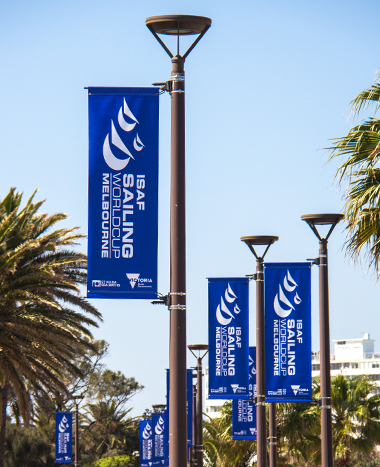 Traditional street light pole flags & light pole banner often fail to meet engineering and Operational Health & Safety requirements as strong winds and environmental factors create a range of safety issues. The BannerSaver™ spring loaded light pole banner bracket system overcomes many of these obstacles due to its ability to spill in excess of 80% of the wind and reduce the loading on both the street light pole and banner. 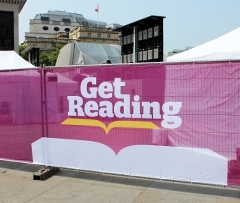 As the wind force increases, the tensioned spring on the BannerSaver™ banner mounting hardware bracket relieves the wind forces and gradually turns the outdoor light pole advertising banner out of the wind. 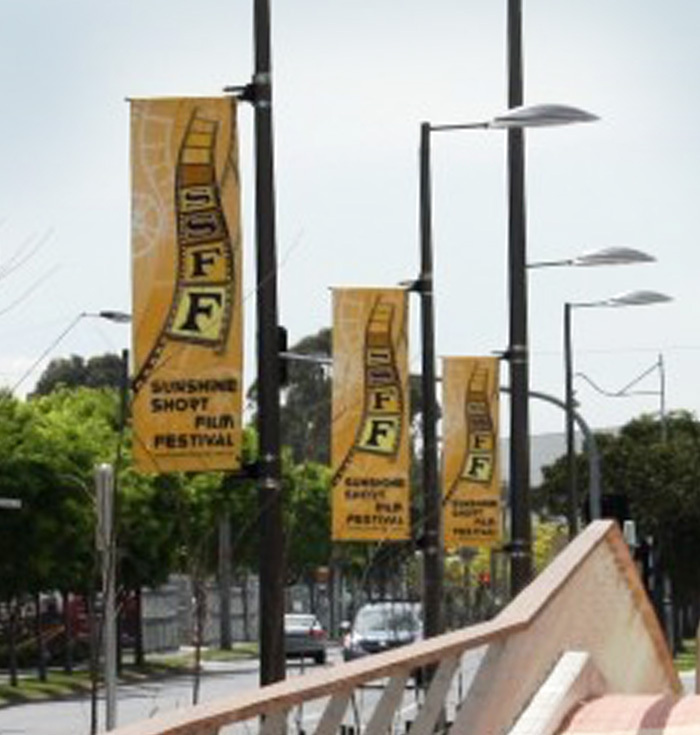 BannerSaver street light pole brackets, vinyl banners and flags are currently in use in all state and territory capitals throughout Australia including Melbourne, Sydney, Perth, Brisbane, Darwin, Canberra and Hobart. Our reach extends far beyond the state capitals, our banners and BannerSaver™ brackets can be found throughout the country with stunning and ongoing results. 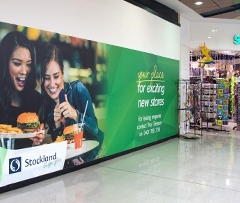 Bay Media use advanced tear resistant block out vinyls and fabrics, UV stable inks, stainless steel eyelets and triple stitched pockets when manufacturing custom printed outdoor light pole vinyl advertising banners. 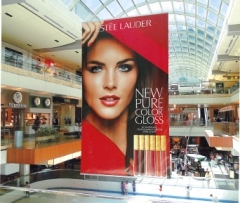 This guarantees a high quality, durable light pole banner or flag that will look great for years to come.